Fox Narrowboats | John Revell's inspiration ahead of the next Old Bedford river Campaign Cruise! Home › Blog › John Revell’s inspiration ahead of the next Old Bedford river Campaign Cruise! John Revell’s inspiration ahead of the next Old Bedford river Campaign Cruise! Waterways campaigner and mooring customer John Revell is sharing some of his previous script on other restored waterways that he has visited as he looks forward to the Old Bedford river campaign cruise on 19th to 22nd August 2018. I spent some time in my youth visiting parts of the derelict Kennet and Avon canal. Re-opening the canal to boats seemed almost impossible then although I do remember helping clean out one of the locks on the Widcombe flight in Bath one bitterly cold day. But the impossible happened and I attended the formal reopening of the whole canal by the Queen many years later in 1990. The next year, 1991, I took my boat along the newly restored canal from Reading to Bristol. Use of the Caen Hill locks at Devizes was very restricted because of problems with water supply but I was lucky to be allowed to descend part of the flight with another narrow boat after the annual general meeting of the Kennet and Avon Canal Trust. As I locked down I noticed an elderly man and his wife looking very intently at my progress. I invited them on board and offered him the tiller. He steered the boat straight as a die into the locks so I thought he must have done some boating at some stage. We talked a bit and after a while I discovered that this modest, unassuming man was John Gould, who I knew had done as much as anyone to keep alive the dream of a restored Kennet and Avon Canal. I asked him when he had last done the flight. The answer was 1947. Kenneth Clew’s fascinating book “The Kennet and Avon Canal” notes that it took 4 weeks for John Gould to complete the journey in 1947 from Saltford to Wargrave and that for most of the way to Devizes two canal gangs of 12 or 14 men were used to bow haul the 2 boats. Things were worse above the flight where a canal gang of 12, a platoon of 11 soldiers, the crew and block and tackle double rigged were needed. John Gould and another pioneer John Knill were the last commercial traders on the canal. He took court action in 1955 and 1956 to try and stop the canal being abandoned. He provided trips in a pleasure launch on the tiny isolated 3 ¾ mile stretch in Newbury and very much more. 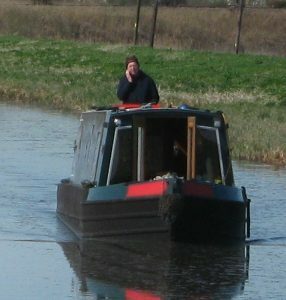 Without people like him the waterways network we can now use would be very much reduced. The second account documents a trip on the South Pennine ring in 2003. Please note that British Waterways in now the Canal and Rivers Trust. A new cruising ring, the South Pennine Ring, was established when the final link, the Rochdale canal, was reopened to navigation during 2002. 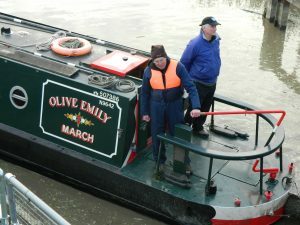 I travelled along the ring in “Olive Emily” in spring 2003 and found it fascinating. It is certainly a complete contrast to our home waters. It is heavily locked. My unofficial tally was 197 locks in 69 miles (which is roughly the distance between Denver and Bedford via Ely). Some locks are brand new, some old, some stiff, some short (the upper Calder and Hebble and Huddersfield Broad canal locks are 57′ 6” long) and some very narrow (6′ 10” according to British Waterways for the locks on the Huddersfield Narrow canal). British Waterways have produced separate navigation guides to the Rochdale and the Huddersfield Narrow canals, which are useful and free. You need to prebook passages through locks 66 – 83 (Manchester Dulcie Street to Failsworth) on the Rochdale canal and Standedge Tunnel (and the last 6 or so locks on either side of the tunnel) on the Huddersfield Narrow canal. You also need to ring the lock keepers to pass through Tuel Lane lock (Sowerby Bridge – this is new and claims to be the deepest lock in Britain) and to cross the summit on the Rochdale canal. If you do not fancy all the locks you can travel through Standedge tunnel on BW’s trip boat or walk or cycle along the well used tow paths eg. the Rochdale canal towpath between Littleborough and Hebden Bridge including the summit. If you wanted to hire a narrow boat Shire Cruisers at Sowerby Bridge are probably best placed with Banks Hire Cruisers at Selby another possibility. The route crosses the Pennines twice so there are some splendid views. There are also urban and industrial areas, a tunnel under an Asda supermarket, the new Manchester City FC ground etc so there is plenty of variety. For the record we never felt in any way at risk and indeed we moored overnight in the centre of Manchester without any problems whatsoever. The most memorable stretches for me were the 2 summits. Standedge tunnel is the longest canal tunnel in Britain, more than 3 miles. It is also the highest navigable pound in Britain (640′ above sea level) and passes deep under the surrounding hills, passing close to a separate rail tunnel. You are not allowed to steer your own boat through the tunnel. Instead BW tow boats in convoys using an electric tug with crews travelling in a separate passenger boat. The view inside the tunnel is amazing because much of the tunnel is unlined with bare rock that has been hewn or blasted out. The short summit level on the Rochdale canal crosses a pass in the Pennines (about 600′ above sea level) with the Pennine Way using the towpath. The scenery on either side of the canal is distinctly mountainous and, if you are as lucky as I was with the weather, this is probably one of the best views anywhere on our canal system. I have read that the last working boat to cross the full length of the Rochdale canal was in 1937, the Huddersfield Narrow canal was abandoned in 1944 and the Peak Forest and Ashton canals were closed between 1961 and 1974. To have restored these waterways to navigation is a fantastic achievement for all concerned. British Waterways, IWA, the Huddersfield and Rochdale Canal Restoration Societies, the fund raisers and those who carried out the restoration work are to be congratulated on what they have done to create the South Pennine Ring. The highlight of my recent canal trip was reaching Droitwich Spa during the celebrations for the re-opening of the Droitwich canals. I have to confess that prior to my journey I had no real idea where Droitwich was. Now I can say it is near Worcester and close to the bottom of the famous Tardebigge flight of narrow locks. I can recommend it. The Droitwich Barge and Junction canals were officially closed in 1939 and Droitwich Canals Trust was formed in 1973 to re-open them. It has been a long haul with money, labour and sheer doggedness from many private and public bodies. One of the volunteers told me that when they seemed to be going nowhere they would organise a working party and 200 volunteers would turn up. No-one could then say there was no demand for the re-opening of the canals. There were lots of other stories. One man living by the canal had bought a tiny narrowboat some years earlier and had used this ever since to go to the shops a few miles down a short stretch of navigable canal. Another told me how part of the canal had looked like an open sewer in the past. Another man had been walking the another section for 20 years. He had known it completely covered over, with an impassable lock without gates (or water). He said it was brilliant to see it fully restored. As we arrived and passed the Droitwich Barge lock the church bells rang – definitely a first. We were told later that the vicar had offered to ring the bells in celebration that morning. There were thousands of people enjoying the sunshine, walking along the canal and looking at all the boats. The press were there in force, a band was playing and the food and beer tents were in full swing. It was a great occasion. The fourth account is of the Chesterfield canal. As published in June 2015 in “Hereward”, the Magazine of the Peterborough Branch of the Inland Waterways Association. I spent nine days in April 2015 visiting the Chesterfield canal. It is an early contour canal designed by Brindley and completed in 1777. The canal declined over the years and most of the mining and heavy industry has long disappeared. This means that most of the canal is surprisingly rural. There are not many boats, a few friendly boat clubs (eg the Retford and Worksop Boat Club) and some good pubs (eg the Brewers Arms in Clayworth). Those venturing beyond Shireoaks can enjoy what I think is one of the finest flights of locks in the country. This should give heart to all of us working to restore to full navigation Horseways Channel, Welches Dam Lock and the Old Bedford River. 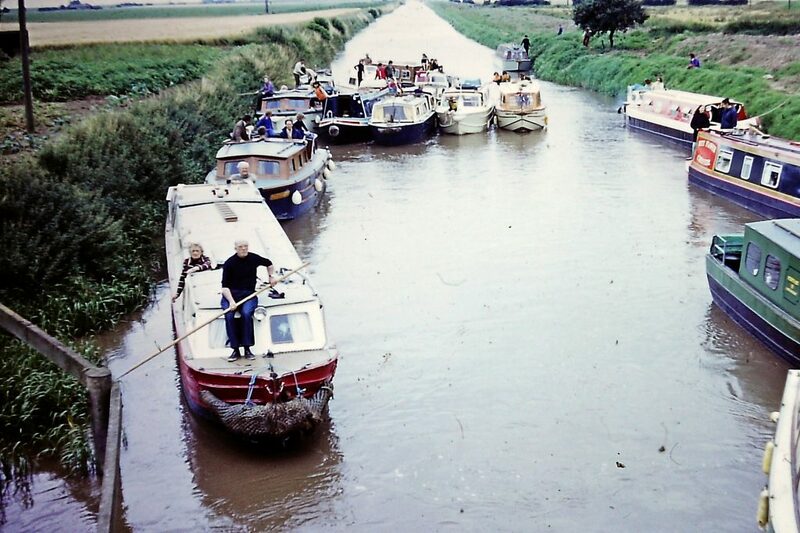 We wish John and his fellow boaters good luck for the campaign cruise in August and sign off with a photo of boaters heading to the IWA festival in Ely back in 1973 at the Old Bedford sluice.